As the Green Cabmens’ Shelters charity gathered apace, better facilities were incorporated into their construction. More were erected and many, including the politicians of the day, wanted to get involved. 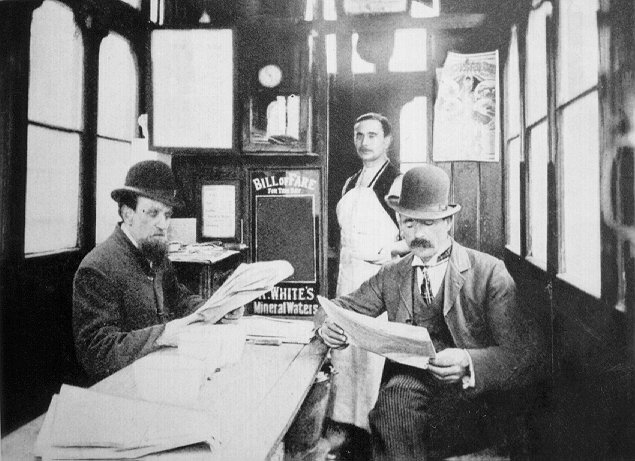 The cramped confines of a cabman’s shelter showing the lunch counter. The attendants were usually superannuated cabmen. Pictured wearing an apron is this shelter’s proprietor standing in the doorway of the tiny kitchen. From the Outing Magazine 1904. As time went on more money was needed to build – and importantly – to maintain the facilities, particularly in the summer when they apparently ran at a loss. In this letter to the Morning Post the Hon. Secretary, John Dennistoun makes a plea for more contributions. Between 1875 and 1950 forty-seven of these shelters were built at a cost of £200 each. At first the shelters had no provision for supplying meals, but by 1882 larger shelters were erected, which included a small kitchen so that hot meals and drinks could be provided by the shelter-keeper or for a charge of half-a-penny the attendant would cook any food brought in by a cabbie. By now the watermen seem to have become the London cab stand officials who ensured that cab horses had enough water to drink. Originally, the watermen seem to have been hangers-on who fetched buckets of water from the nearest pump, or did other services for hackney coachmen and their passengers in exchange for tips. By 1850 the waterman had become a quasi-police official charged not only with supplying water, but also with keeping order on the stands and administering punishments after disturbances. Ironically, the watermen were paid by the cab drivers themselves from a compulsory fee of one penny for each time they came onto the stand, and a further half penny each time they were hired from it. By 1860, watermen had been absorbed into the police force and were not only paid a regular wage of fifteen shillings a week, but were also issued with uniforms. The proviso laid down by the Metropolitan Police that, as these shelters were situated on the public highway, that they could be no larger than a horse and cart. This has given them their characteristic style. 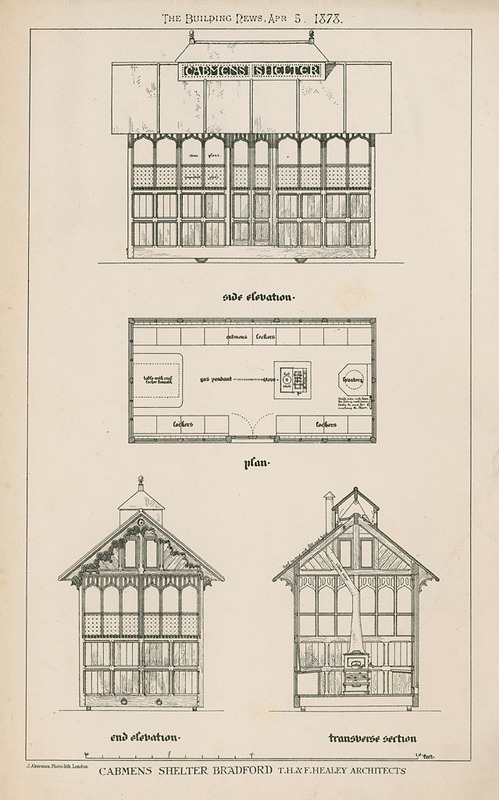 They are of rectangular shape with dimensions described as ‘7 bays long, by 3 bays wide’. Windows are situated on the upper part of the walls in the middle bay of the short sides, and in the second, fourth and sixth bay on the long sides, with the middle window replaced by a door at one end. The roof was originally felt-clad, but is now more often protected from the elements by traditional slates or oak roof shingles and pitched. 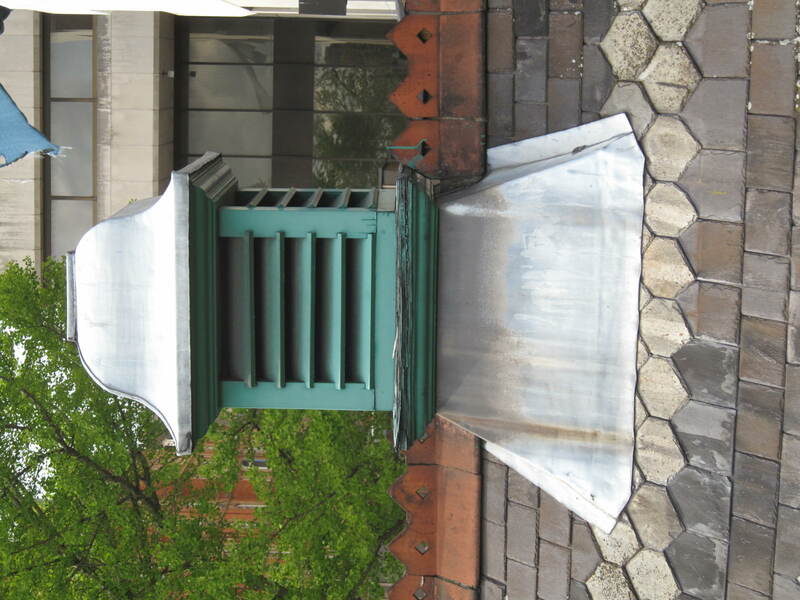 In the middle of each shelter was a wood burning stove with a flue leading up a the vent in the roof to carry off the smoke, this square slatted ventilation structure on the roof is not dissimilar to a dovecote. There are railings around the shelters that were intended for the tethering of the Hansom cab’s horses. Some of these can still be seen today. 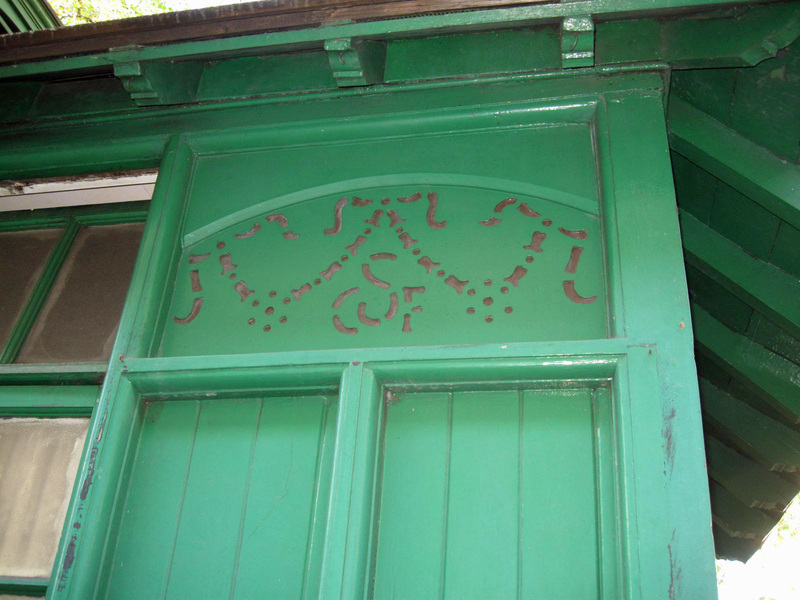 The upper panels between the windows are decorated with a pattern of holes that include a monogram CSF, standing for Cabmen Shelter Fund, which most shelters have. However, some shelters have either glass or wood in the top panels instead. The whole shelter is painted the distinctive Dulux Buckingham Paradise 1 Green. Inside, it is warm and bright but this is no Tardis, the shelters really are tiny with enough space for only 10-13 diners. Two benches run along the white walls behind two long, thin Formica tables with hinged leaves for squeezing into your place. Two people can pass with care in the central aisle, if they turn sideways. At the far end the shelter the proprietor resplendent in their apron moves between a cooker, fridge and packed shelves of sliced bread and chutney.